Winterizing Your Home | Gold Eagle Co. Nights are getting colder all across the continent. Soon, the deciduous trees and shrubs in your neighborhood will start to change color, and before you know it, snow will be flying. Some of us look forward to colder weather because it signals a refreshing change in the pace of our lives. We get to wear sweaters, cross country ski, drink more coffee and go to bed earlier. But changing leaves also serve as nature’s reminder to address some home projects you’ve neglected during the warmer months. Winterizing your home is imperative to saving money on monthly maintenance costs and keeping your home functioning efficiently. 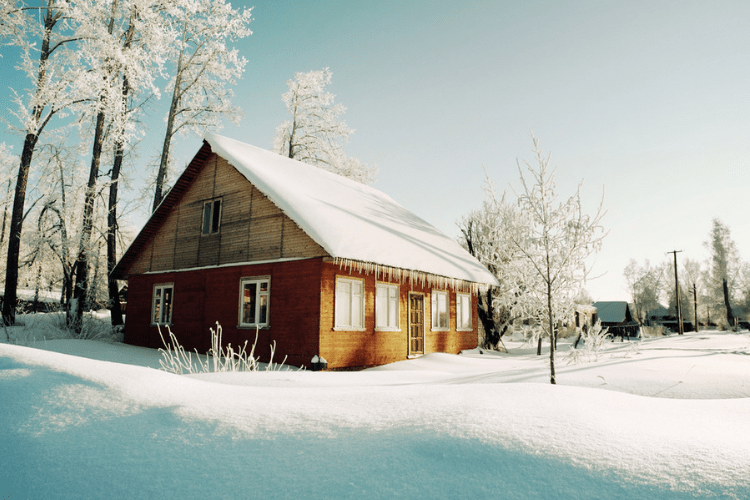 So before it gets too cold, complete these simple projects to cut home energy costs. This is probably the weirdest tip on the list, but trust us, it works. Running your ceiling fan in a clockwise direction (most fans run counterclockwise to cool a room) pulls pooled warm air from the upper reaches of your living area, effectively distributing otherwise lost heat throughout your house. Experts say this simple step can save homeowners up to 10% on their heating bills. Cheap, single pane windows are generally sufficient in warmer climates, but in colder regions, cheap windows are one of the biggest contributors to high energy costs and drafty living spaces. Unfortunately, replacing single pane windows with new storm windows and doors is not cheap. So, before you call up your builder to get an estimate on new windows, consider installing window plastic in draft prone areas of your house. Window insulation kits are cheap and readily available at most hardware stores, and make quick work of keeping your living spaces warm and cozy during the winter season. If you’re worried about having to look through a plastic sheet all winter, don’t be. Most window insulation kits are nearly clear, and hardly noticeable once installed. It goes without saying that holes in the exterior of your home can lead to disruptive airflow and an imbalance in your home’s heating and cooling patterns. Air penetration can take on a lot of different forms, but is relatively easy to spot. Walk around the inside perimeter of your house with a lightly smoldering stick or piece of punk and watch for wavering in the smoke. This is an easy test to determine where air is leaking into your home. Most likely, you’ll find that doors and windows are the culprits. In the event that your windows and doorways are leaking air, pick out some foam weather stripping to fill excessive window and door gaps, or try spray foam insulating and then re-caulking your interior trim with paint-grade caulk. Head down to your basement and feel each piece of exposed piping that runs out of your hot water heater. If you notice that any length of pipe is extraordinarily warm to the touch, consider applying pipe insulation sleeves. Most hardware stores offer pre-slit pipe insulation in common pipe diameters, so installation is as simple as cutting to length and duct-taping them in place. When you’re shopping for sleeves, try to find the models that are highest in “R” value. The “R” scale is the common industry metric for how insulating a product is. The higher the value, the more complete the insulation is. This is your dad’s least-favorite chore, but one of your most important ones, particularly if your house is shaded by lots of deciduous trees. Each fall, your gutters get packed with fallen leaves, and unless they are routinely cleaned out, your gutters will develop a mat of organic matter that can lead to structural damage and ice build up come winter. So take a hint from your dad. Get out a ladder and thoroughly clean and inspect the gutter and its hangers for damage. While you’re at it, check out the downspouts as well to insure that water leaving the roof isn’t pooling on your driveway where it can turn into a dangerous icy spot in the winter. Additionally, consider installing heat tape on the eaves of your roofline to prevent ice build up, and talk to a specialist about adding a leaf grate to your gutters to avoid having to clean them out every year.